Using the easy open chords, follow the rhythms and down/up markings shown on the sheet. Exercise 13 – strum down for 2 beats, then down up down up. The counting would be “1 (2) 3 + 4 +”. 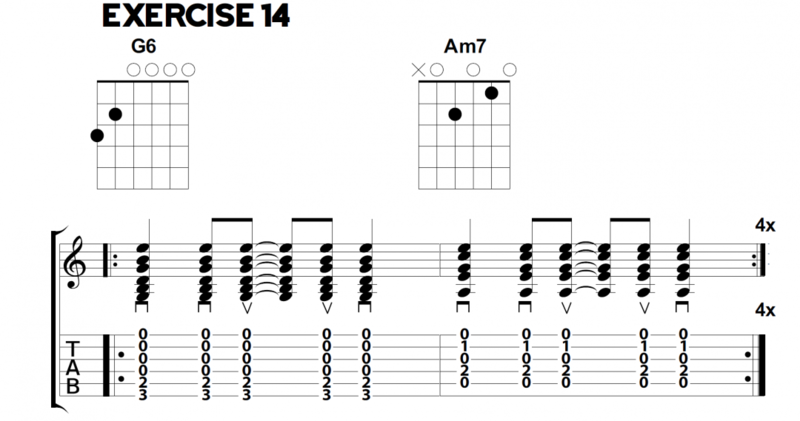 Exercise 14 – strum down for 1 beat, down up (small space) up down. The counting would be “1 2 + (3) + 4”. The counting in brackets are where you count but don’t strum anything.